In large bowl, mix all ingredients except wonton skins, additional green onions and soy sauce. Cut wonton skins with 3-inch round cutter. Place 1 wonton skin on work surface. (Cover remaining skins with damp paper towel to prevent drying out.) Lightly brush edges of wonton skin with water. Spoon 1 teaspoon filling just below center of skin. Fold wonton skin over filling to form a half moon; press edges to seal well. (Cover filled wontons with damp paper towel to prevent drying out.) Repeat with remaining wonton skins and filling. In Dutch oven, heat 3 quarts water to boiling. Add half of dumplings. Boil 3 to 5 minutes or until edges of wonton skins are clear. 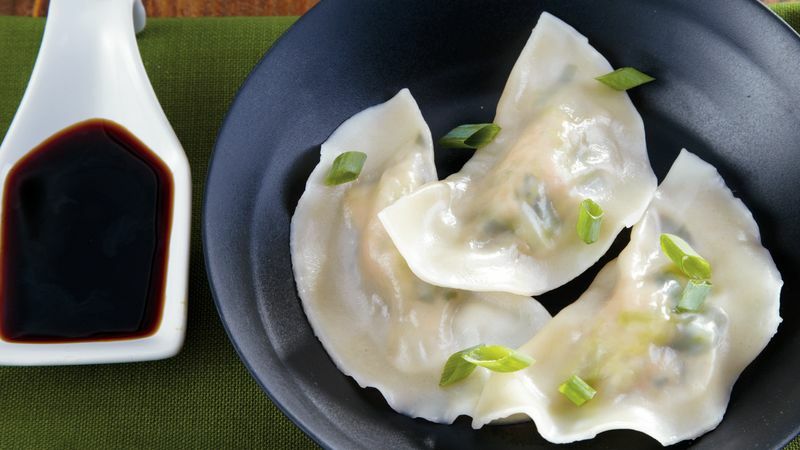 Using slotted spoon, remove dumplings from water; drain on paper towels. Repeat with remaining dumplings. Garnish with additional green onions. Serve warm with soy sauce.